Kliptown, established in 1903, is the oldest residential area in Soweto. The town holds a rich history, attracting several tourists to the area where the South African freedom charter was adopted, but a contrast between the business district and the residential area means different things for Kliptown business owners who rely on tourism. The sleek white Mercedes minibus reaches a halt in the middle of Walter Sisulu Square in Kliptown, south of Johannesburg. The American occupants step off and walk into the sunlight wearing hats, sunglasses and holding cameras. They are on a Soweto tour and will see the Regina Mundi church, Hector Pieterson museum, former president Nelson Mandela’s house, the homes of Nobel Peace prize winner Archbishop Emeritus Desmond Dube as well as the Apartheid Museum and Gold Reef City. The tourists walk directly towards a short but plump man standing outside a tower which is a monument marking the square where the Freedom Charter was drawn up in 1955. Enock Ngwambe is the short plump man welcoming the tourists in preparation to show them around the Walter Sisulu Square of Dedication. The square was opened on June 26, 2005, in commemoration of 50 years of freedom in collaboration with development agency, Blue IQ and Johannesburg Development Agency (JDA). The square is divided into three parts. On the eastern wing is a structure built for businesses, hosting an art center, clothing stores, internet cafés, a dance studio and restaurant among other ventures. On the west wing is a closed off marketplace set up for informal traders selling fresh produce, clothing and CD’s among other things. Ngwambe walks the group to a small museum where the tour begins with The People Shall Govern Exhibition. 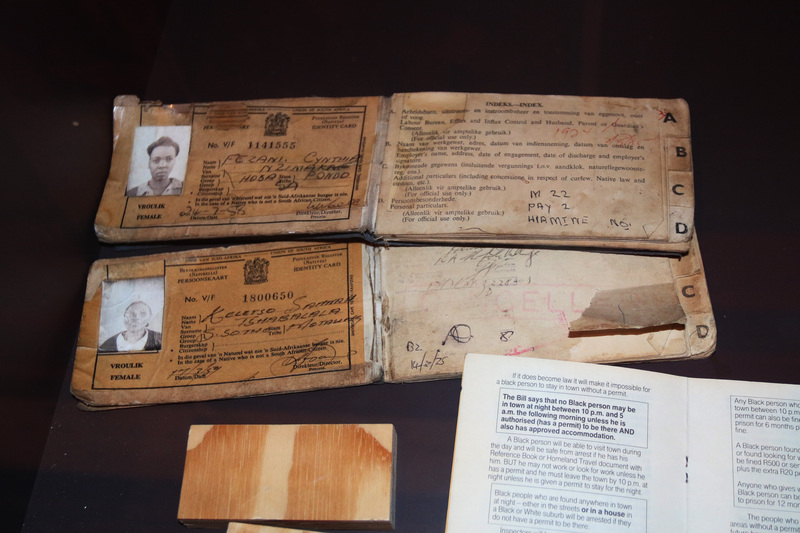 Ngwambe has been working as a museum guide for the City of Johannesburg for the past ten years, providing visitors with knowledge on the South African Freedom Charter and its significance in Kliptown. 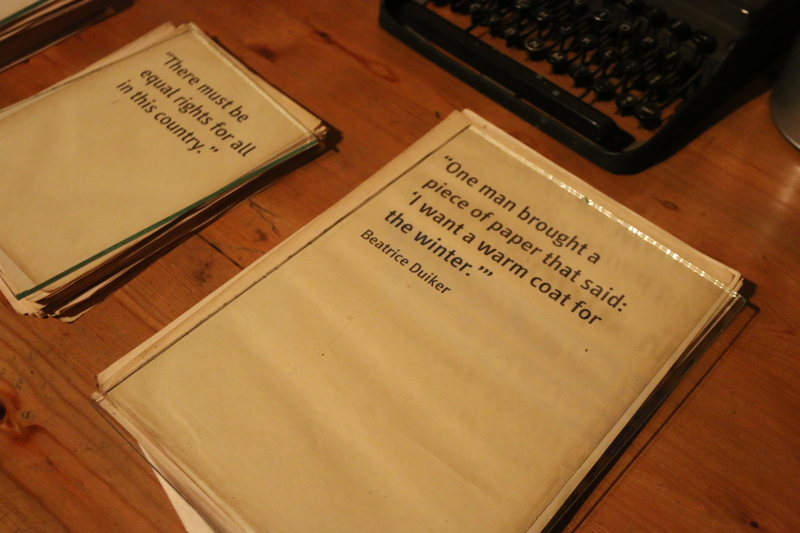 He starts the exhibition tour, showing tourists examples of Dompas books, original documents that citizens submitted as proposals for the freedom charter, the large metal pots women cooked in, the history of the Jada family who allowed delegates to use their property and explains who the metal figures representing apartheid struggle veterans are. Hereafter, he leads the group back out into the sunlight to the tall tower, The Freedom Charter Monument. The monument has four diagonal entrances forming the ‘x’sign used to vote during elections, this ‘x’ sign also shines through from the top of the tower. The group walk around the granite circle reading the engraved ten clauses of the freedom charter. 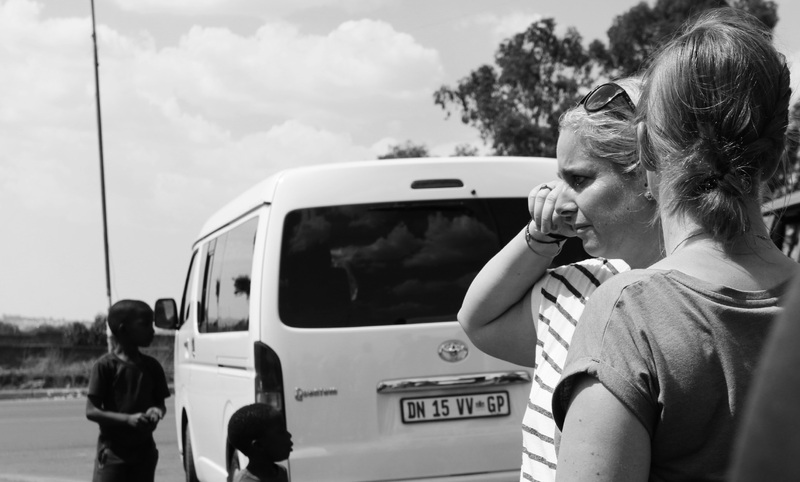 Hereafter,Ngwambe introduces the tourists to a site-guide, Vusi Ngcobo, who takes the group into the community over the railway line that divides the residential and business district along with other Swiss and Swedish visitors. The tour of the residential part of Kliptown allows tourists to get a sense of the lived experience of the majority of those who live in Kliptown as 85% of all housing units in Kliptown are informal makeshift shacks according to a study by Himlin, Engel and Matoho (2008). By now, we’re standing on the bridge across the road from the open-air museum. There is a sharp contrast between the business district and the residential area as we overlook several zinc makeshift homes which are divided by sand paths. OVER THE RAILWAY: Kliptown’s residential area AS SEEN from the bridge over the railway line. 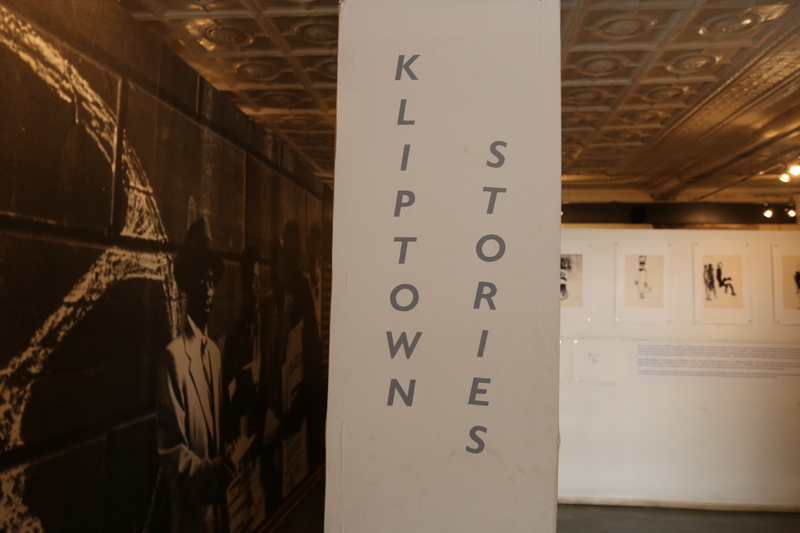 The Johannesburg Development Agency’s 2004 business plan to enhance heritage, education, and tourism outlines Kliptown’s development. 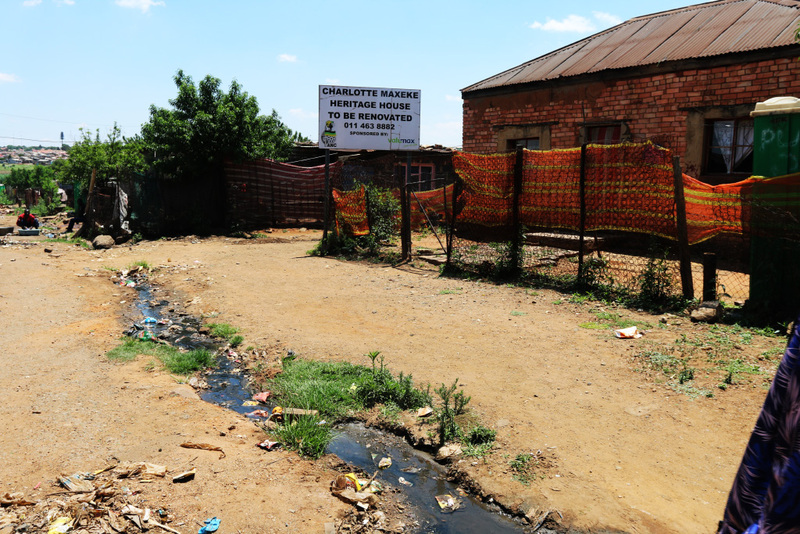 It states that the reason the town lacks infrastructure and resources is because it fell outside of the boundaries of the Johannesburg municipality until 1970. 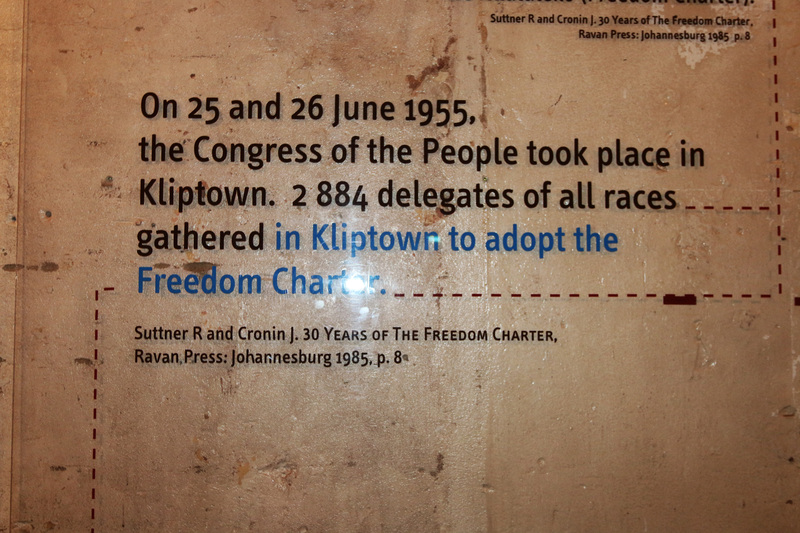 As a result, Kliptown, unlike the greater Soweto did not gain the development resources such as transport networks, electricity, water and sanitation. 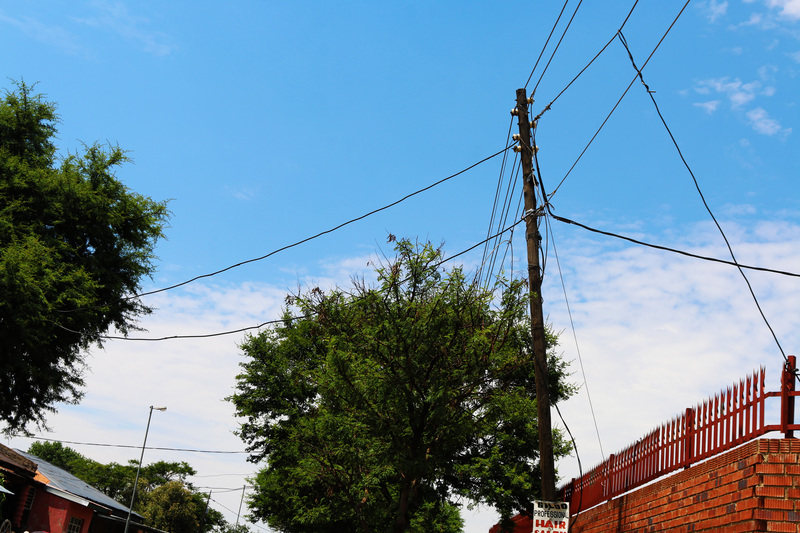 IZINYOKA: Illegal electricity cables connected to a main cable, hang in the air. 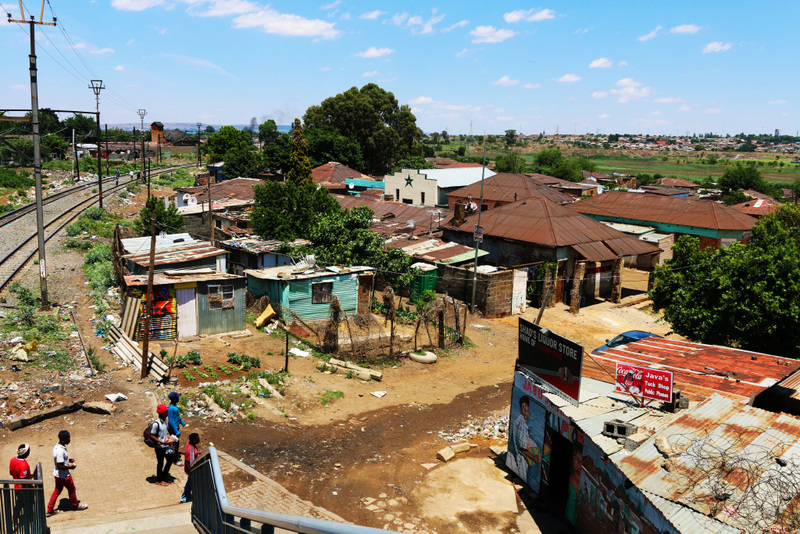 Ngwambe says that although tourists visit Kliptown on their tour of Soweto, there’s not much that they can do for the people who are struggling. 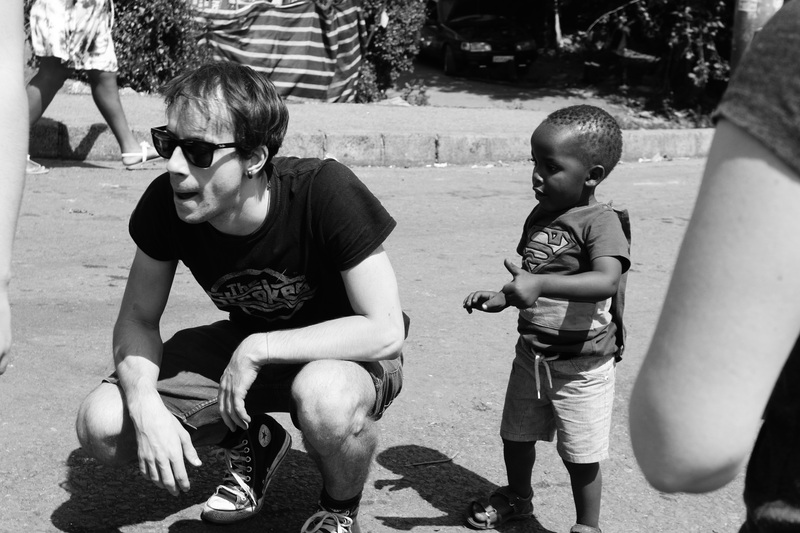 “Sometimes they make donations, it’s small amounts from individuals like R50 so families can buy food for one day,” he says, “but after that one meal? What happens tomorrow when tourists don’t come?” he asks. His question hangs in the air like the Izinyoka cables [illegally connected electricity lines]. As the group walks through the shacks greeting the young children who are cheering the tourists on, one of the Swiss females, becomes emotional. “Amalungu! Amalungu!” the children shout, which to them is simply any foreign person in Kliptown though Amalungu actually means white person in Zulu. Her face [the tourist] has pulled red and she continuously wipes her tears. Her Swiss translator, Mary says in a deep accent that it’s their first time outside of Europe. As they enter the last stop of the tour, a one bedroom shack which is home to a family of nine, Mary says , “where we come from there is a lot of money, it’s not easy to see the way people live here, I don’t know how to describe it, but we’ve left some clothing donations at the hotel.” she says. 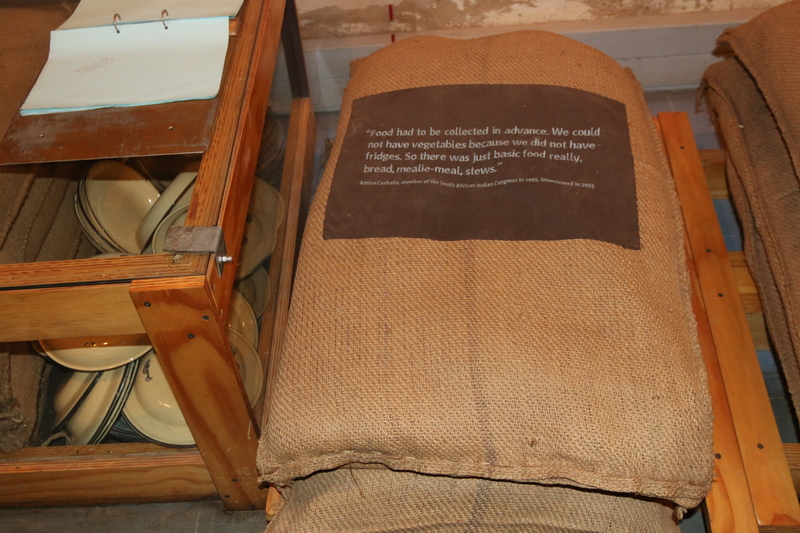 The Soweto Hotel and Conference centre, which is in the same location as the small museum where Ngwambe works, is one of the tourism establishments that aims to assist the community by employing residents from Kliptown and surrounding Soweto areas. It is a quiet afternoon at the swanky, Soweto Hotel and Conference Centre, back at the Walter Sisulu Square. The hotel is the only four-star hotel in Soweto. It is also the first black-owned and black female managed hotel, with businesswoman and hotelier ,Lindiwe Sangweni-Siddo as the owner. Welcomed with stairs imitating a red carpet, brown, orange and gold hues give the hotel its African feel. This is along with the black and white photographs of musicians such as Miriam Makheba and Alf Khumalo performing in the 80s which go hand in hand with Soweto’s jazz history and Rusty’s jazz bar situated after the foyer. The hotel opened its doors in November 2007 to offer accommodation at an international standard to over 200 000 tourists who visit the township. Busisiwe Mashobane who is part of the hotel’s sales support, says that the hotel offers a new experience to both local and international guests. “The Sandton experience is overrated as it mirrors what you can find overseas, but our hotel offers a unique African experience as it is the only hotel in the township,” she says. The hotel also aims to do more for the community , creating job opportunities by employing all their staff from Kliptown and surrounding Soweto areas. Additionally, Mashobane adds that, the hotel also contributes to the community by sourcing their fruit and vegetables from members of the Kliptown and Soweto community. Alternatively the hotel engages with organisations in the community to which the hotel provides left-overs or merchandise that the hotel no longer needs. “Whatever we can give, we do,” she says. Nomsa Mthelezulu has some similarities with Soweto Hotel and Conference Centre, establishing the first and only Backpacker accomodation in Kliptown but says the lack of amenities in the residential area hinders her from being as successful as the Soweto hotel. Mthelezulu is the founder and owner of Kliptown Backpackers, her backpacker’s is on the other side of the railway and is situated two houses away from struggle veteran Charlotte Maxeke’s which is waiting to be renovated into a heritage site. Charlotte Maxeke, born 7 April 1984, became the first black South African woman to receive a bachelors degree. She graduated with a Bachelor of science from the Wilberforce University in Ohio, United States of America. Maxeke also founded the Bantu Women’s League, which fought against the proposition to extend pass laws to women during apartheid. 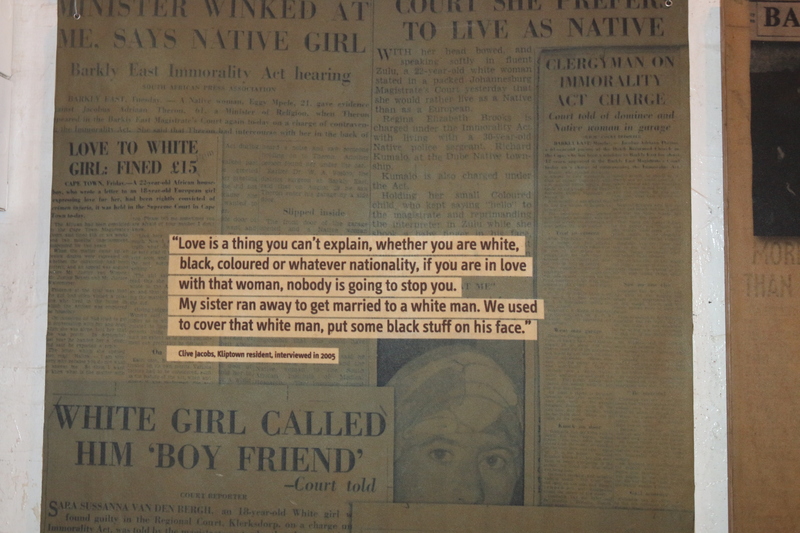 According to Blue Plaques, which marks and commemorates significant historical sites with blue mosaic plaques, Maxeke lived in the Kliptown home towards the end of her life and is buried in Kliptown. While giving her keynote address at the International Women’s Day commemoration at the Walter Sisulu Square in March 2015 Infrastructure Development MEC Nandi Mayathula-Khoza commited to converting the Kliptown home of Maxeke. Maxeke’s home would be turned into a museum and interpretation centre to commemorate the stalwart and boost tourism and job opportunities for the community of Kliptown. During this address, the MEC also committed to bettering the lives of those who live in Kliptown, however two years have passed and Mthelezulu says the only change, is the board that has been placed in Maxeke’s yard stating that the house will be renovated. Mtheluzulu, who turned her home into tourist accommodation says that her backpackers is ideal for international students who are doing research in the area, or anyone who may be visiting for a long duration and wants a real experience living in Kliptown. She made some upgrades inside and outside the home she’s been living in since 1971. When you walk in, you’re greeted with natural light shining through the windows in the living room and bouncing off the white tiles and walls in the home. The room has a light fragrance courtesy of the washed linen. Guests have the option of staying in a dormitory room with two single beds, or a single room with a double bed. Each bed sports fresh white bedding, accompanied by toiletries and blue throws. “I also make African food if that’s what my guests want,” she says. Mthelezulu says that after she hosted 4 American teenagers in 2007, she saw a business opportunity and decided to register for an accommodation permit to start up Kliptown backpackers. Since then, she has hosted guests, mainly researchers, from Japan, United Kingdom and China among other countries, but admits that it has been difficult operating her business. Walking from the city center towards her backpacker’s sewerage water runs through the informal settlements. The strong smell which, Mthelezulu describes as “so bad you don’t want to eat”, is a combination of human waste and refuse dumped at the railway lines. She attributes the lack of amenities in the community as one of the main reasons her business isn’t doing well. “It was hard and still is a struggle to get people to stay here,” she says. She adds that she envisions a better life in Kliptown but says that this will only be possible if government steps in because without roads where she is situated, potential customers cannot get to her which prevents her from improving her business. “I wish they’d help us because if business booms here, I can employ more people from the community, and maybe life will be better for a lot of people,” she says.